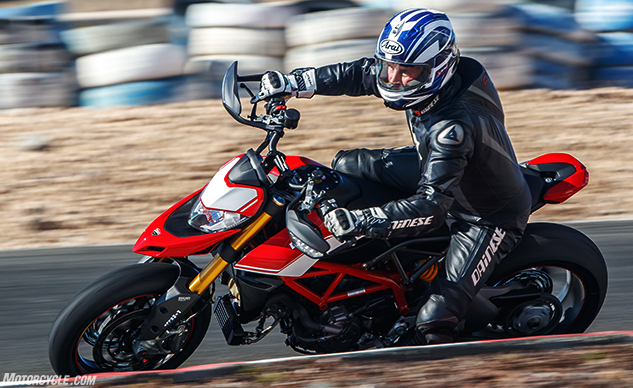 Last week you read all about the new 2019 Ducati Hypermotard 950 and 950 SP and saw the photos in living color. Today, it’s time to watch the stunning, action-packed 3:35-minute video, filmed on location in beautiful Gran Canaria and starring yours truly in a performance the Academy will have to stand up and notice. Sorry there’s no onboard footage, as I hit the Still Photo option on the GoPro instead of Video, but it’s the thought that counts. There is plenty of beautiful footage courtesy of Ducati‘s crew, though, and there’s even a wardrobe malfunction. Roll film! WTF is up with turn signals built into bark busters? Exhaust Double under-tail aluminum muffler; catalytic converter and two lambda probes. Safety equipment Riding Modes, Bosch Cornering ABS, Ducati Traction Control (DTC) EVO, Ducati Wheelie Control (DWC) EVO. Optional Equipment Anti-theft system, Ducati Quick Shift (DQS) up/down, Heated grips, Ducati Multimedia System (DMS). Anti-theft system, Heated grips, Ducati Multimedia System (DMS).